A day after the fire at Bagri Market, firefighters were still trying to tame the flames and shop owners were busy salvaging whatever they could, a group of men from the nearby Saifee Mosque ensured that no one went hungry. Since Sunday morning, they have been serving food and water to firemen, shop owners and police personnel at the site. 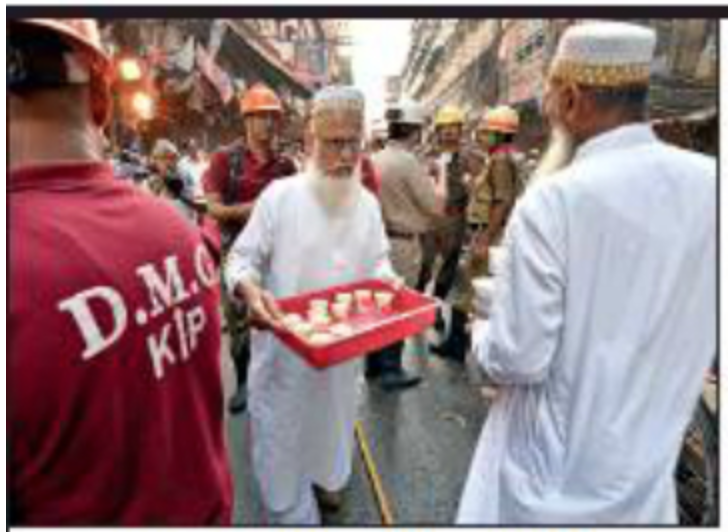 The community kitchen at the mosque — barely 300m from Bagri Market — swung into action after the devastating fire broke out and the volunteers of Dawoodi Bohra Samaj (DBS) have been on their feet, serving food. Since Sunday 450 food packets each for lunch and dinner have been prepared. Given the mixed crowd, the volunteers are serving vegetarian food. “Apart from the firefighters and cops, we noticed the shop owners, who were too traumatised to even think about food. We could not sit and watch when the incident unfolded in our locality,” said Juzer Ratlamwala of DBS. The organisation’s officials, including Ratlamwala and its secretary, Shiekh Ali Asgar Totanawala, supervised the entire operation. “We are doing this for the sake of humanity. They are our neighbours and it is our duty to serve them. This is what our religion teaches us,” Ratlamwala said. “We will continue to serve food till the firefighting operation is over. We will also give the kind of support that is needed,” Ratlamwala added.